Homepage / Dog / My Dog is Scared of Fireworks, What Can i Do? Is my dog afraid of fireworks? 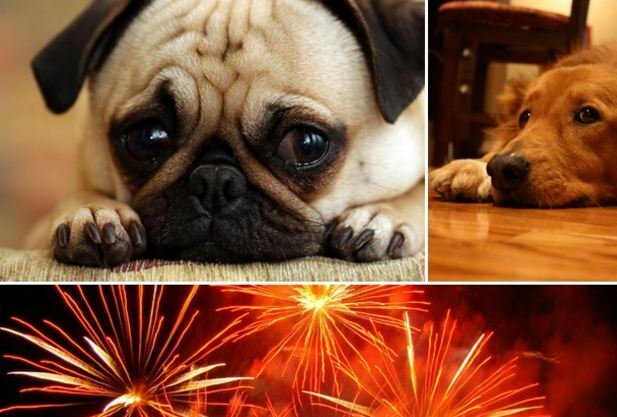 The fear of fireworks is a very common phobia in dogs. New Year’s Eve is a feared era by owners and dogs. It’s normal that they frighten the loud and sudden noise and the glare that forms in the sky. Even the most confident and balanced dog can frighten and be afraid of sounds that are not familiar to him. The good news is that there are some things you can do to help your dog pass with more tranquility for this period of festivities – and fires. Put this video on your dog to hear as low as possible a few times a day. Associate the sound of fires with something your dog likes, eg: Favorite snack, Toy, ‘s your turn, brushing etc. Start increasing the volume of the video over the days and continue to associate the sound of fires with something your dog likes, so that it associate: roaring fires = good thing. If your dog shows any signs of fear at any time, lower the volume to the point where it feels comfortable. Repeat as necessary every day until your dog can hear the sound of the fires very loud without being frightened. If you didn’t have time to prepare your dog for the New year, or if the desensitization did not eliminate his fear altogether, there are some things you can do to ease the fear of your dog from the fires. These tips should be helpful for dogs that have a medium/moderate level of fear. During the turn of the year, do not change your behavior. Most people tend to pamper/host their dogs when they demonstrate that they are afraid of fires. People make more affection than usual, embrace, talk to dogs with a sweet voice. Instead of helping to end the fear, this owner’s behavior reinforces fear in the dog. He associates fear = affection. Try not to react to the fireworks. If you demonstrate readiness just before the fires, on account of your dog’s fear, it will only worsen what he feels. You’ll end up making him anxious. Your body language tells your dog if he needs to be scared or not. Do not force your dog to anything. If he wants to hide under the bed, let him. Do not force him to do anything he does not want, because this can lead to an increase in fear and the dog can become an aggressive dog if it comes out of its comfort zone. If your dog gets terrorized with fireworks, it may be that no hint above works to ease his fear. If you think your dog is such a case, talk to the vet because it may be the case of administering an anxiety medication or some sedative that helps your dog stay calmer during fires. It’s still time to desensitize your dog and get used to the noise of the fires as best as possible. You and your dog will pass the turn of the year much more peaceful. The method name is Tellington Touch. It is known that animals that have this kind of dread also have great sensitivity in the back regions, paws and ears. The method consists of tying your dog with a ribbon to stimulate blood circulation in the extreme regions of the body and thereby reducing its irritability. Previous post How Long Does a Turtle Live? Next post Oral Flea Medication for Dogs, Is Good?